It’s the time of year when the days are longer and outdoor furniture comes out of storage. Whether you lounge in handcrafted teak Adirondack chairs or pull up your favorite metal frame seat to your vintage glass-top table, patio furniture requires some necessary maintenance. 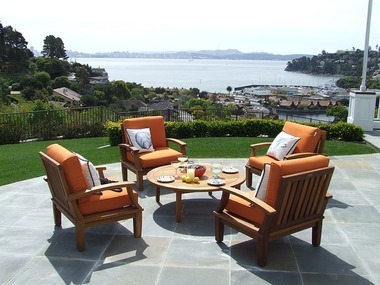 Read on for our seven tips for maintaining your patio furniture. 1. Clean it periodically to prevent dirt and debris from dulling the finish. Regardless of the material, the finish will eventually lose its sheen if left unattended. Besides that, you don’t want pollen pants after sitting down on an unkempt chair in the springtime. For that initial cleaning at the start of patio season, do not be afraid to rent a power washer. You’ll save time and elbow grease by enlisting the help of a power washer in that scrub session. 2. Cover patio furniture when you’re not using it. Sun, wind and rain will eventually take their toll on fabrics, paint and stain. Using a custom cover or all-purpose tarp will help extend the life of your furnishings. 3. Keep rust under control by addressing the problem as soon as you notice it. If you’re in a humid climate, your metal patio furniture (or components like nails) is susceptible to rust. The brown, flaky stuff is the result of exposure to oxygen and moisture, unavoidable for outdoor furniture. Grab some WD-40 and a wire brush and scrape off the iron oxide before it spreads. 4. Mildew is not your friend for many reasons. It’s smelly and unsightly and can cause health problems. It is a survivor, though, and will cling to surfaces like gum on the bottom of your shoe. Mildew does not fare well in the presence of vinegar or baking soda. Both readily available agents will eliminate blight on the surface and the interior of cushions. Plus, you can use it to clean umbrellas or other colorful accessories without the adverse effects of bleach. 5. Paint is your friend when it comes to maintaining your patio furniture. If your metal table and chairs need a facelift, grab a few cans of spray paint formulated for outdoor use. Refresh the appearance with minimal monetary investment. 6. Water always wins. Even if the fabric or treatment claims to be waterproof, at some point water will penetrate the coating. If at all possible, move furnishings indoors when the season is over. Inside is also the best place to avoid damage from high winds and hail. 7. Table glass looks best when you can see through it. Prevent scratches, residue buildup and other blemishes by grabbing the rubbing alcohol and newspaper. Pour or spray liberally and wipe down with something you can recycle. Whether you’re cleaning for houseguests or planning to list your home for sale, connect with me for more ways to keep your home in tiptop shape.